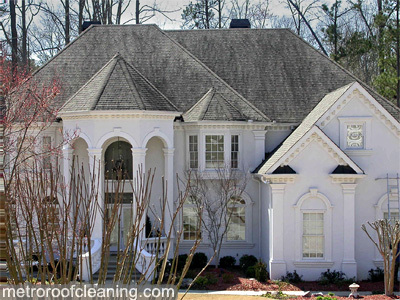 "Let the experts clean your roof"
We are Georgia's roof cleaning professionals!! 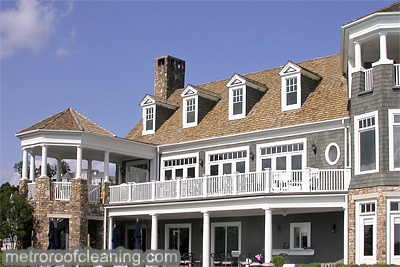 We will safely and affordably clean your roof of all stains, moss, algae and mildew, leaving it looking new. 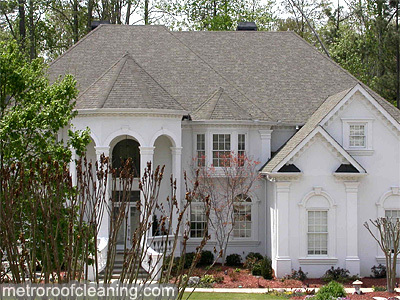 Are you tired of looking at black stains on your roof? You may not need a new roof. Before you spend thousands of dollars on a new roof, let us give you a free estimate. With our treatment, your roof will be clean! Getting on your roof can be dangerous and can cause damage to your roof. Our employees are trained to safely treat your roof stains without doing damage to your roof. We have researched the causes of roof staining, and how to treat them. We use extreme care with regard to safety, using the proper equipment such as safety harnesses and the proper footwear. Our patented formula is completely biodegradable and not harmful to the environment.